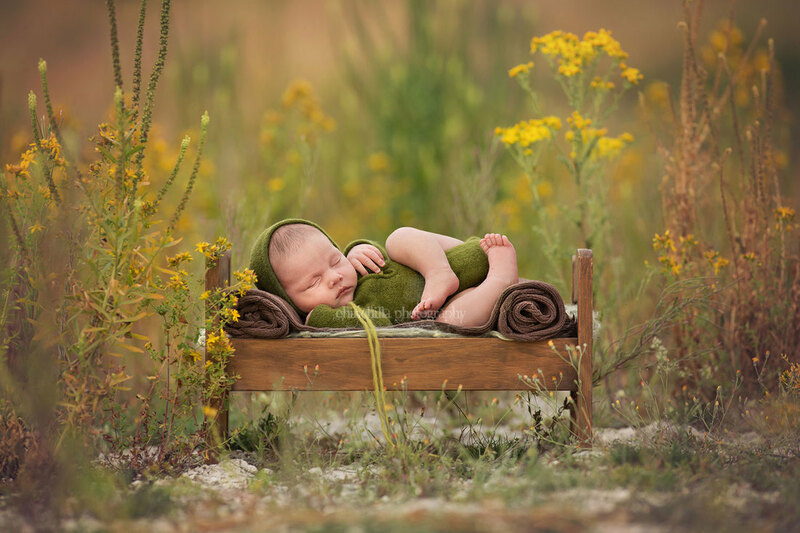 Creating memories of your perfect, tiny baby in these precious early days. Available for newborn babies due between mid-April to mid-September, preferably when baby is around 1 week new, or up to 2 weeks. We never shoot in rain, in the event of a rainy or unseasonably cold day, we will move your session to a new date as soon as possible. 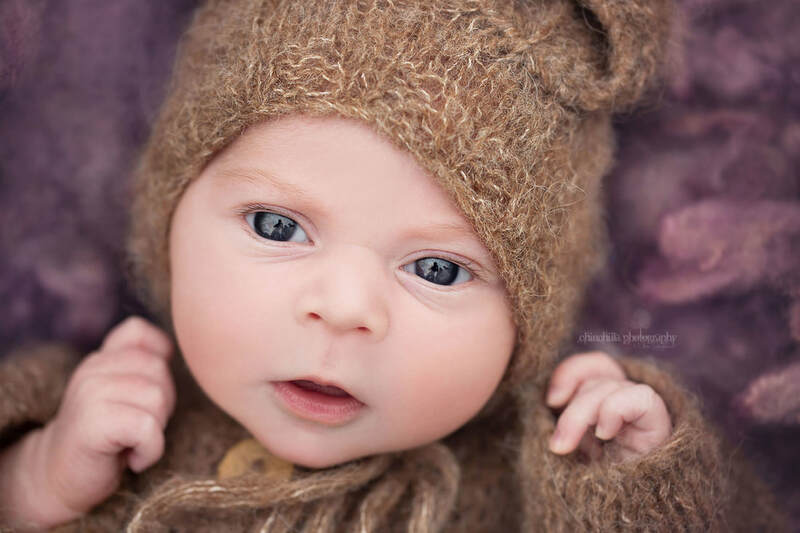 Whereas newborn sessions can only take place when the weather is warm, you are able to take a family session with a newborn in Winter, providing baby is dressed in something nice and cosy, such as a snow suit. If it is mild enough we may be able to wrap baby in blankets. 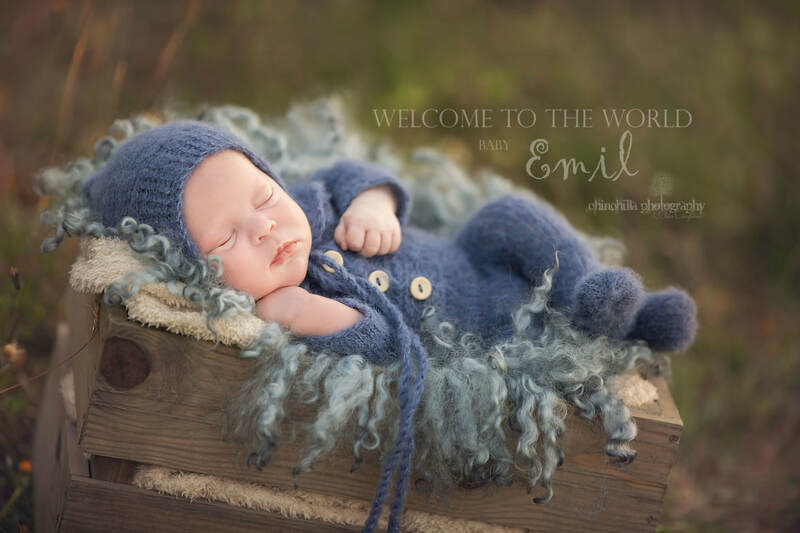 When Baby has arrived, I will send you a quick form to fill in with your preferences. These sessions are roughly 2 / 2.5 hours long, although there are no strict limits (aside from running out of daylight) and you will not be charged any additional fee for longer sessions. 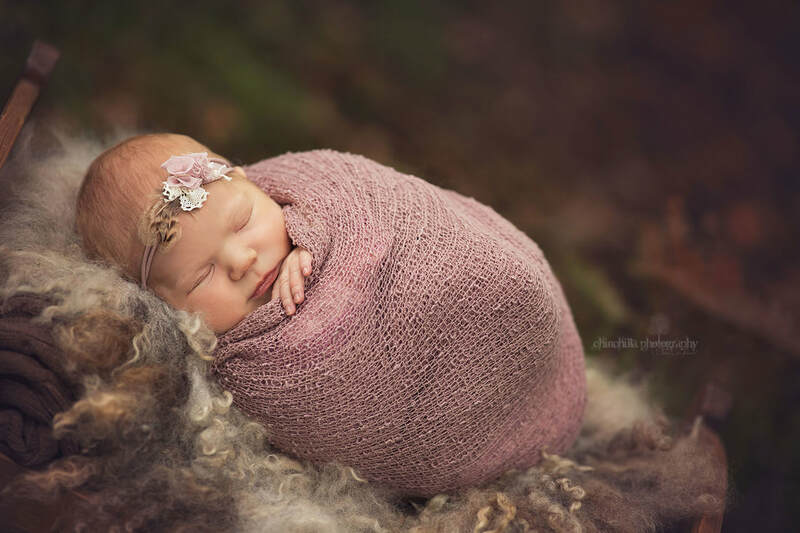 ​For these outdoor sessions, baby will be dressed in one of my newborn outfits, and then wrapped in my special newborn wraps. 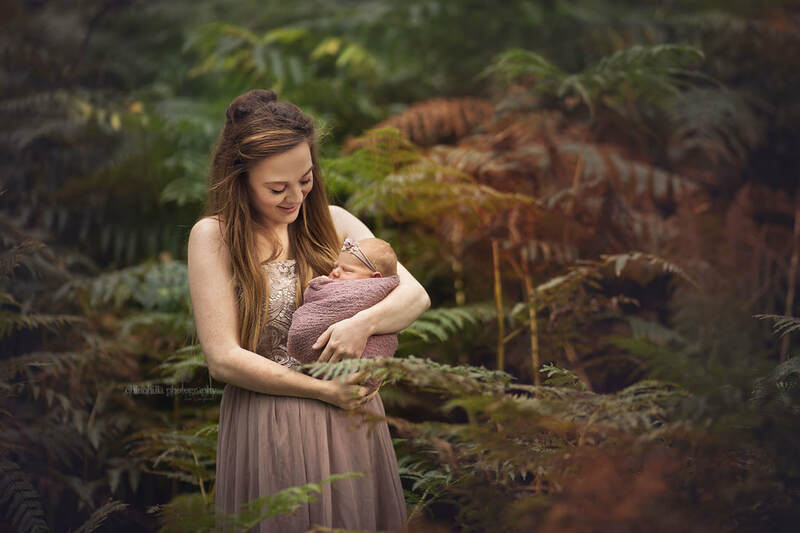 The sessions are family focussed, so baby is photographed with mum & dad, and also using props, surrounded by beautiful grasslands, woodland or flower meadow, depending on your chosen location and time of the year. ​If the weather is particularly warm, we will be able to undress baby, otherwise they will stay wrapped and cozy. ​Sessions always take place in the few hours approaching sunset when the light is soft and there are no harsh shadows, the sun is low in the sky which makes the surroundings look rich, golden and vibrant.​​ The time of your session will therefore depend on the time of year. ​Just a plain / neutral vest is fine, and we will be able to undress baby and use lighter outfits. Please also bring a onesie with you (footless is best), in case the temperature drops. Baby can then wear this underneath wraps or thicker outfits. Please dress baby in a plain, neutral coloured, footless, handless onesie, with a vest underneath. Use mittens and socks for hands and feet, and a hat. When we arrive at our location, we will pop one of my knitted rompers over the top of baby's own onesie, and then use wraps over the top of this. These layers keep Baby nice and warm, and the mittens, socks and hat will be removed and replaced with my knitted hats / headbands when Baby is in position ready for the photos to be taken. Please let me know if you have any preferred colour schemes for your session, and bare in mind that the colours we use will have to sit nicely with the surroundings. The ideal location will depend on the time of year. This is often decided nearer your session time, so that I'm able to check out different areas of the countryside nearer the time and see what's happening. Different locations vary year-to-year and it can be impossible to know exactly what will be growing or how a location will look in advance. 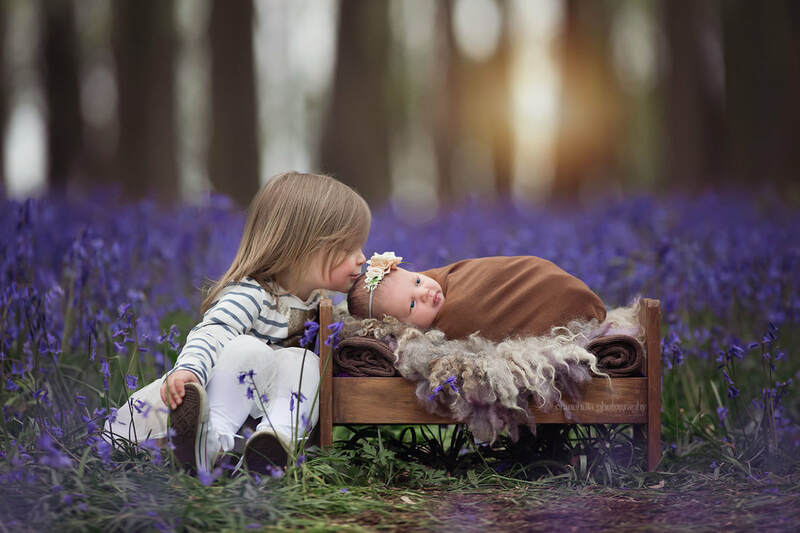 ​With newborn sessions running mid April to September, this covers lots of beautiful settings, such as bluebells (mid April - mid May), purple fields of lavender (July - August), flower meadows and possibly fields of poppies. 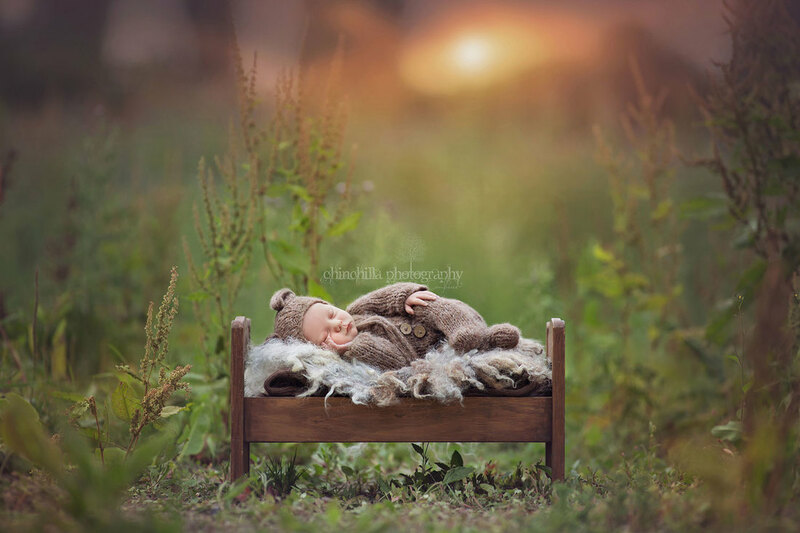 ​If you have any favourite props that you would like me to use, just let me know and I'll bring them along - you can see a list of newborn props here. I have a variety of hats, headbands and other beautiful accessories that I will bring along to suit your chosen colour schemes. ​Your precious baby's safety is of the utmost importance. During these sessions, I will ask Mum or Dad to assist with spotting (watching baby close by, and placing a hand on them if they should wake up or move), or supporting baby where necessary for composite shots (this is when Mum or Dad's supporting hand/arm is digitally removed during editing). An example of a composite image where Dad's arm has been removed is shown above. ​Wear clothes that you feel comfortable in - if you are worried about post-baby lumps and bumps, I am able to help with this during editing. I have some of my own outfits that you are welcome to use - see Mother & Daughter Dresses. As for all sessions, I recommend avoiding very bright, clashing or neon colours. ​In the warmer months, you are welcome to bring an outfit change to add more variety to your session, but please bear in mind that changing will eat in to our session time. 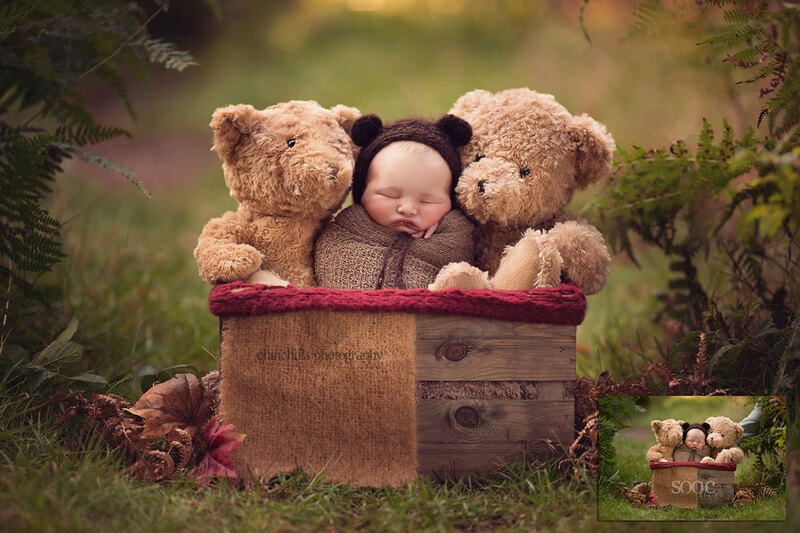 ♥ If baby uses dummies please bring a couple along, as this will help settle baby. ​♥ Any special teddies, toys, tiny shoes or any other meaningful items that you would like to include (please cut the fabric tag off teddies). ​♥ If baby is bottle fed, bring enough milk to last a 2 hour session, plus some extra just to be on the safe side. Babies do cry if they feel like it, please don't feel awkward or worried that baby crying is disruption our session, it is perfectly normal and we will take the time to rest with baby, and feed and comfort him or her as needed. There is no rush. If baby is too unsettled to take enough images to fulfil your package, a follow-up session will be offered at no extra charge. This however is very rarely necessary. Some babies will happily sleep through being moved about, some will stir and wake at the slightest touch. All are unique and have their own preferences as to how they want to be posed (and some just won't want to be posed at all). 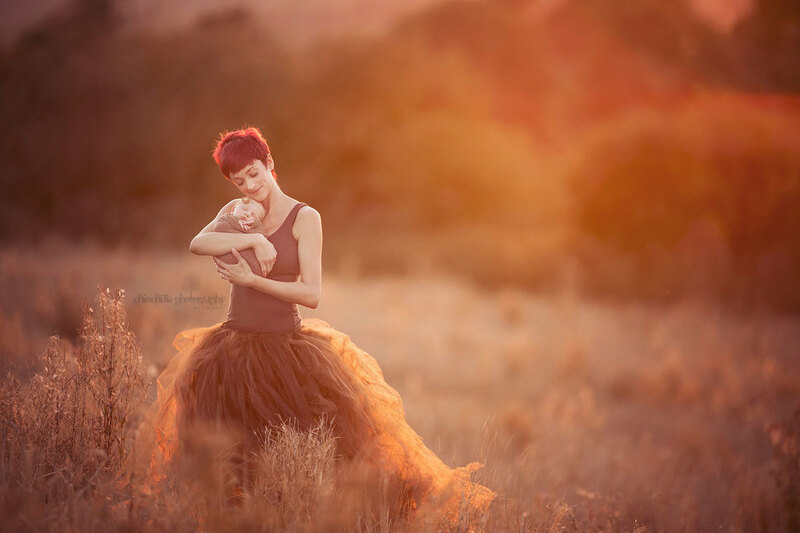 Your images will reflect your baby as they are at this precious time in their new life. ​Your private proof gallery will be sent out to you within a week of your session. This gallery contains the best images (around 35, although may be less) from your session as unedited proofs, with a selection of edited examples, so that you can see how your images look when finished. Each of your chosen images is lovingly hand-edited; first processed from its Raw file, before skin touch-up, colour cast removal, natural teeth whitening, detail enhancement, natural eye enhancement, shadow & highlight correction, removal of any background or foreground distractions and beautiful, natural colour enhancements. For some sessions, there will be some extra editing such as falling leaves. 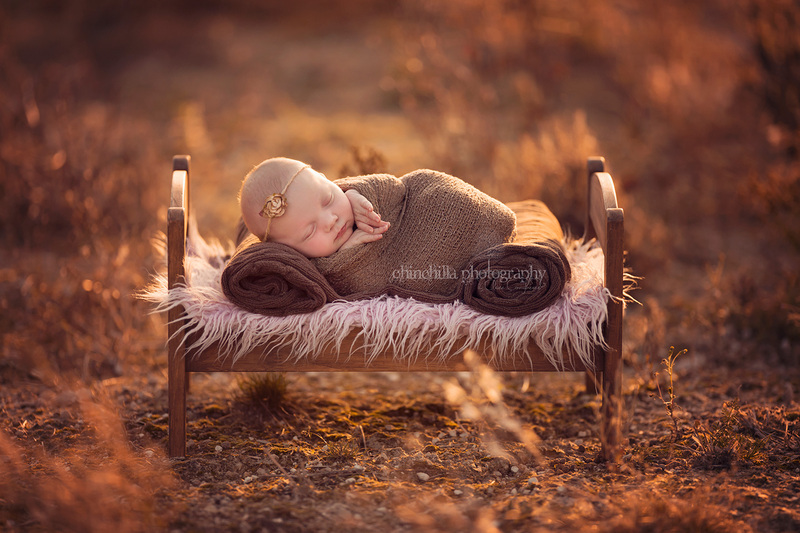 ​I just love all those tiny newborn details; tiny toes, fingernails, eyelashes, skin creases, soft hair, sweet little lips. These fleeting, beautiful details are what we capture during your session. ​However, most tiny babies will have some degree of dry/flaky skin, baby acne or milk spots, scratches from tiny fingernails, jaundice (yellow skin), red skin, blotchy skin and various types of birthmarks. Some may have temporary bumps on their little heads from their journey through the birth canal, or sometimes marks from forceps. 'Stork Bite' birthmarks (these are the temporary birthmarks, generally on baby's forehead, between eyebrows and over eyelids, below the nose or on the back of the neck, which fade as baby gets older. Most babies I see have these to some extent) - slightly softened / lightened, not completely removed unless requested. ​Permanent birthmarks - left alone, or slightly lightened if requested. ​Temporary bumps on the head from birth - If baby has a significant bump, just let me know if you'd like this adjusted or not. Other marks from delivery such as forceps marks - if baby has significant marking, it may be best to delay the session until they have faded (this doesn't usually take too long) - just get in touch with a quick photo for me to take a look. Any minor marking can usually be removed. Skin colour corrections only - you want to see every precious little detail up close! A note about sticky eyes - some newborns have slightly sticky eyes, which can dry crusty. This is extremely difficult (often impossible) to correct in post-processing as it involves the eye creases and eyelashes. If baby has sticky eyes please bring something to clean as we go - cooled boiled water in a pot and some cotton wool is ideal.